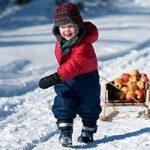 For the past few months, Ambrosia apple fans have been sharing pictures of Ambrosia apples in various different scenarios as part of our Ambrosia Apple a Day Photo Contest. The contest closed on March 15th and then it was up to the judges to select the winning image. Congratulations to Stirling McIntosh from Thunder Bay, Ontario for his winning photo ‘Ambrosia Delivery.’ Click here if you’d like to see it – we guarantee it will make you smile. Just because the contest is over it doesn’t mean you have stop showing off your great photos of Ambrosia apples. We always love to see them! Share them with us on Twitter, Facebook, Pinterest, and Instagram. Canada’s top curlers and curling fans loved having Ambrosia apples on hand at this year’s Tim Horton’s Brier in Brandon, Manitoba. This is Canada’s national men’s curling championship and we were proud to be a sponsor. 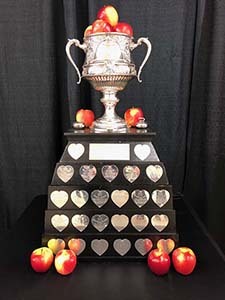 Before Team Alberta (led by Kevin Koe) took home the cup, we had some fun filling it with delicious Ambrosia apples! Looking for a new light-lunch or snack idea that’s healthy and full of flavour? 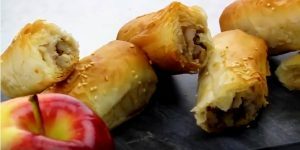 These savoury phyllo rolls filled with Ambrosia apples, walnuts, and tahini are just what you’re looking for. The recipe takes some cues from Turkish, Cypriot, and Greek baking but we put a local spin on it by stuffing the rolls with Ambrosia apples. This international snack is easier to make than you might think – let us show you how in this video. Do you remember when the idea of ham and pineapple on a pizza seemed strange? Flash forward a few decades and we decided it was time to rethink this classic. Our approach is decidedly more Canadian but it’s still salty, sweet, and delicious. Check out this recipe for the Ambrosia apple and bacon pizza.